E.L. Cord started out selling cars for the Auburn Automobile Company. Editor’s note: This is the 19th in a 30-day series featuring cars from the Tammy Allen Collection to be sold October 13-15 at Barrett-Jackson’s 2016 Las Vegas Auction. E.L. Cord started out selling cars for the Auburn Automobile Company. In a short time, Cord was able to buy a controlling interest in Auburn and within a few years had purchased Duesenberg and begun his own namesake automobile company. Formed by 1929, and the fledgling company, Auburn-Cord-Duesenberg, went on to produce some of the most spectacular cars of the pre-war era. The first Cord model, the L-29 of 1929, was the first American car with front-wheel drive. It was stylish and stately, but the timing couldn’t have been worse, and it was discontinued after three years of disappointing sales. For several years, there were no Cord automobiles until he approached designer Gordon Buehrig about bringing the name back. Buehrig had been working on a design for a “baby Duesenberg,” and this design became the Cord 810 of 1936 and 812 of 1937. The engine was a V8 with aluminum cylinder heads that was designed and built by Lycoming, an engine company that was part of Cord’s empire and one that is still in business building engines for light aircraft. Horsepower was a very respectable 125, which went up to as much as 190 with the optional supercharger, and that kind of power gave top speeds of 90-110 miles per hour. Like the L-29, the 810 featured front-wheel drive, but it added a 4-speed transmission with electric pre-selector. The 810 was also a pioneer in the use of unibody construction. The 810 also featured retractable headlights and hidden door hinges, and did away with running boards. One of just 404 cars produced, this restored 1937 Cord 812 Phaeton offered from the Tammy Alllen Collection, without reserve, at Barrett-Jacksons Las Vegas auction is finished in beautiful black exterior and burgundy interior. The engine is a Lycoming V8 rated at 125 horsepower and coupled to a 4-speed transmission, which is operated by a vacuum/electric shift system. The Cord has been updated using Oldsmobile Toronado-type CV drive systems for durability. The convertible top is tan cloth with a correct glass prism rear window. 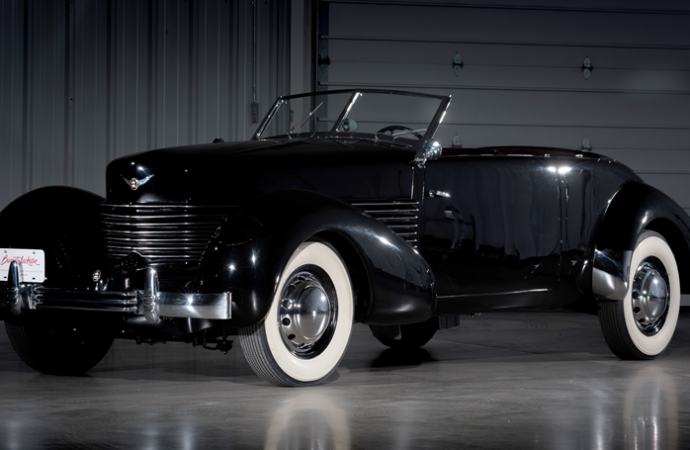 This 1937 Cord 812 Phaeton and the rest of the Tammy Allen Collection will be crossing the block at no reserve as part of Barrett-Jackson’s ninth annual Las Vegas Auction, October 13-15 at Mandalay Bay Resort & Casino. For more information, visit www.Barrett-Jackson.com/Bid or call 480-421-6694. Absentee bidding options powered by Proxibid are also available.